The year 2011 was the 36th consecutive year the Downers Grove Fire Department participated in the Keep the Wreaths Red program. A wreath displaying red bulbs is hung at each of the four fire stations in Downers Grove. If a holiday related fire occurs between December 1 and January 1, one of bulbs in each of the wreaths must be changed to white. In the fire service, we know that there is a greater chance of fires occurring over the holidays than during the rest of the year. Therefore, it is always our goal to "Keep the Wreaths Red". There have been very few years that our firefighters have had to replace one of the red bulbs with a white one. Luckily, there were no holiday related fires this year, though firefighters did respond to one call involving arcing Christmas tree lights. In this case, the homeowner had called 9-1-1 first, and was able to extinguish the fire before responders arrived. The lesson to be learned here is to ALWAYS call 9-1-1 before any other attempts to put out a fire. That way, if the fire continues to escalate, you know that help is on the way and there has been no delay in getting help to arrive as soon as possible. Tragedies such as home fires always cause us to look inward and ask, "What about me?" "Is my house safe from fire?" It is at these times that we get serious about fire safety, check our smoke alarms, and vow to be more diligent about our safety habits. As 2012 gets underway, let me remind everyone that fire can happen to anyone, at any time. The best fire protection is to practice fire prevention throughout the year. Install smoke alarms on every floor of the house and provide one in each bedroom, especially children's bedrooms. Practice home escape plans and designate a family meeting place where everyone knows to meet in front of the house. If there is a fire, get out immediately and call 9-1-1. Do not try to fight the fire unless it is very small. Never go back in once safely outside. Perform a sweep of the living areas before going to bed or leaving the house to make sure all candles are extinguished, cigarettes are doused, fires in the fireplace are out, and the stove is turned off. Take care of nearby fire hydrants to clear snow, ice, and overgrown bushes, if you are able. Firefighters will need immediate access to these hydrants in the event of a fire. The Downers Grove Fire Department takes pride in its highly trained firefighters and paramedics, and its state-of-the-art equipment. They will always be there when you need them, but even their best response cannot alter the rapid growth of fire during those first few minutes before a fire is discovered. The Downers Grove Fire Department wishes everyone a safe 2012! 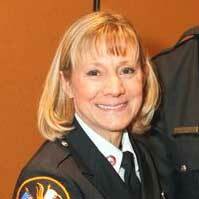 Hot Topics is written by Marsha Giesler, Public Information/Education officer for the Downers Grove Fire Department. She is a nationally recognized leader in fire safety education.